Meanwhile, Bill does the same to Thomas. Thomas just can&apos;t believe what Bill is telling him. He explains how he got the information from Caroline. He says she doesn&apos;t want to be a burden. Steffy tells Caroline that Sally isn&apos;t even close to her league and they will need to work fast to get Thomas back. She adds that family and children are everything. Quidge decide they are not going to Monaco because of Eric. They want to be there if he decides to come home. They wonder what kind of magic beans Sheila is selling to Eric. Eric wonders if Sheila could turn back the clock. She wants to go back to when they were happy, but that&apos;s not the time he was referring to. Sheila backs up and tells him she didn&apos;t want to be the one to tell him about Quidge. Bill informs Thomas that Caroline has an autoimmune disease. He adds that no one is supposed to know. However, Bill thought he had a right to know since he is Douglas&apos; father. When asked, Bill claims he doesn&apos;t know how long Caroline has to live. Sheila tells Eric she worked very hard to make changes in her life. Despite her past, he appreciates what she&apos;s done for him. Sheila says she&apos;s okay with just being friends if that&apos;s all Eric wants. Sheila asks if Steffy and Liam would give his location away to Quidge. Steffy tells Caroline she&apos;s worried that Bill will bully Thomas into coming back. Caroline agrees, saying it wouldn&apos;t work out if he did. 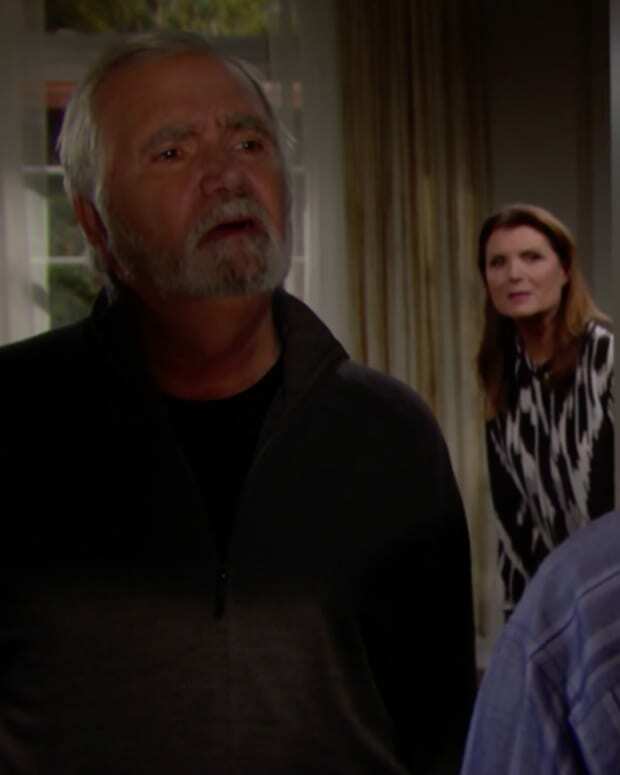 Thomas gets angry with Bill&apos;s insinuation that he abandoned his family. He claims he still loves Caroline and he tried to make it work. He agrees that he has to be there for his family now. Bill confides that he regrets missing out on his boy&apos;s lives. Later, Caroline stops by Spencer. Bill tells Caroline that Thomas will be going to New York with her permanently. She gets excited and gives him a hug. She asks how he managed to pull it off. He tells her it was easy. He told Thomas she was dying. At Spectra, Thomas scrolls through family pictures on his phone whilst Bill&apos;s warning echoes in his empty head. Steffy joins Ridge at the house. He tells Steffy that he and Quinn are worried about Eric and what Sheila is doing to him. Steffy admits she knows where Eric is. Ridge demands to know if Sheila is with him. She tells him yes. At the hotel, Sheila slowly embraces Eric from behind. This time, he turns around and hugs her back.